Our ‘Fill The Tundra’ campaign was once again a huge success. 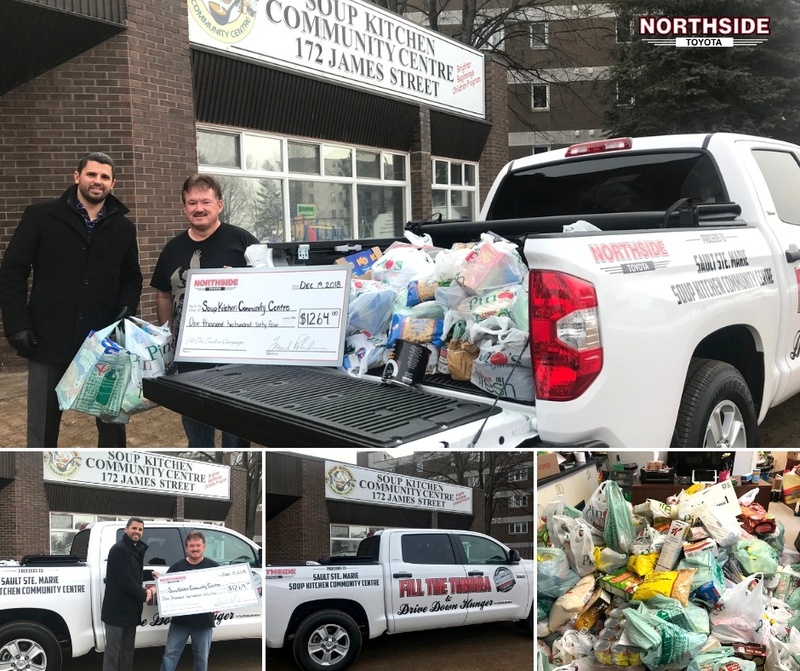 On December 19th, 2018 we were proudly able to deliver MULTIPLE FULL Tundra’s worth of food to the Soup Kitchen Community Centre. We also presented them with a cheque for $1264.00 from cash donations made during the campaign. Extending a big thank you to everyone in the community who generously donated during our campaign and helped us ‘Fill the Tundra’ this holiday season and drive down hunger. Another big thank you going out to the our two Northside sponsored hockey teams, the Northside Toyota Pee Wee Major AA Soo Jr Greyhounds and the Northside Midget A Wildcats for their efforts in our campaign. They helped make this campaign a success by volunteering their time to help gather goods and donations from our grocery store partners Pino’s Get Fresh and Rome’s Independent Grocer.